Who else is as excited as I am for Valentine's Day? I'm looking forward to it this year because I have not one, but TWO hot dates planned. One with some sweet senior citizens & another with a bunch of my favorite ladies for Galentine's Day! But every year I heart VDay because I love Love. Even though we should love one another daily, it's nice to have a day set aside specifically for telling or showing people how much you love them. The world would be such a beautiful place if we loved one another more. I mean, can you imagine? So let's be sure to tell at least one person each day this week, "I love you!" It does the heart and the world good. Speaking of love, I love the color pink. Funny side story: I was catching up with a high school friend after 4 years of not having seen each other and we met up at a crowded mall in Asia. When he found me, the first thing he told me was, "It was so easy to spot you since I knew you'd be wearing pink." Haha! 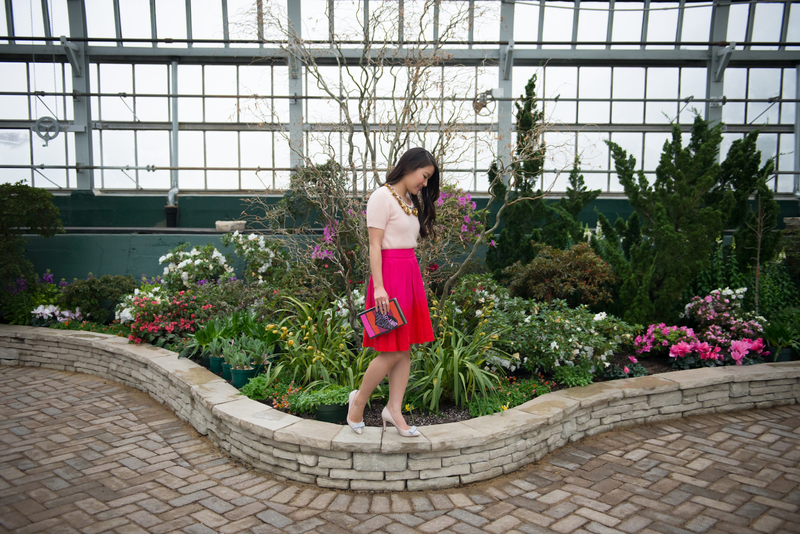 This Valentine's Day date look was so fun to put together since it really illuminates my style. Thankfully I had a talented friend, Trisikh, to capture it so beautifully for me! Don't forget to enter the $750 Amazon Giveaway AND the $400 Target Giveaway to sweeten your Valentine's Day! 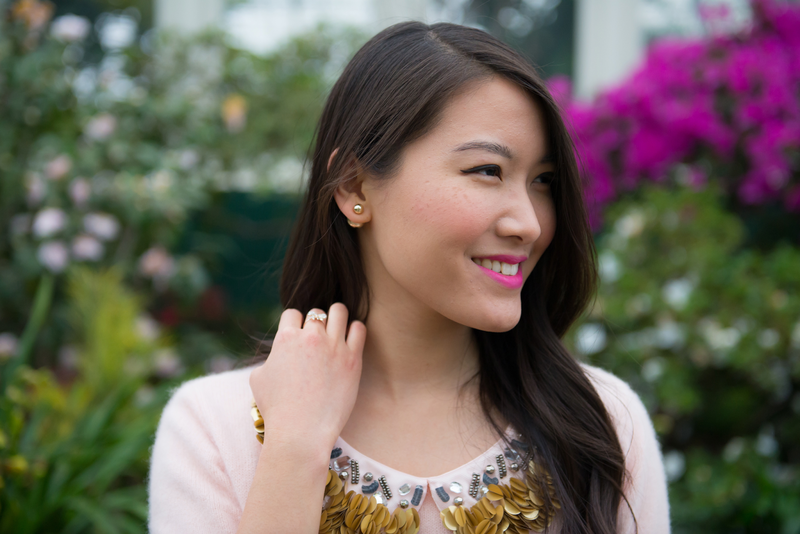 Such a pretty feminine look. I love pink and red. OMG GIRL! 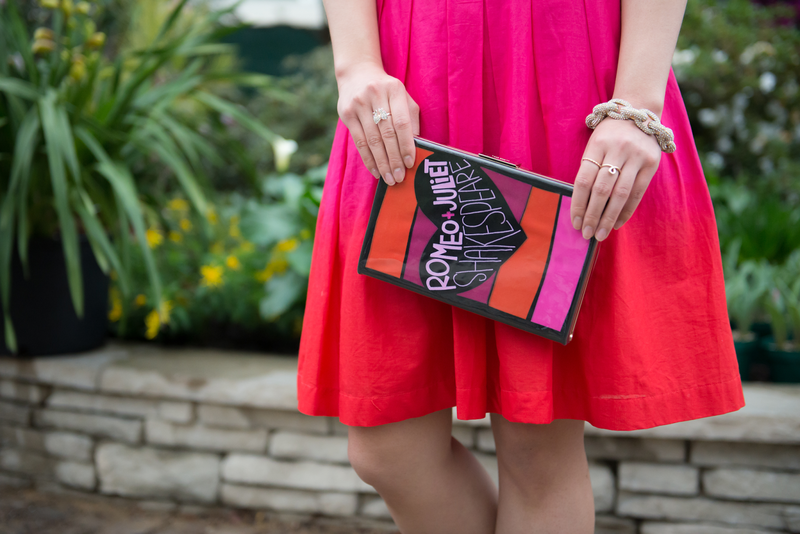 Great minds really do think alike -- I just posted a Pride and Prejudice Kate Spade clutch for Valentine's Day! They are such romantic wardrobe pieces -- your Romeo and Juliet version couldn't be more perfect for Galentine's Day AND Valentine's Day! I love the bejeweled top! 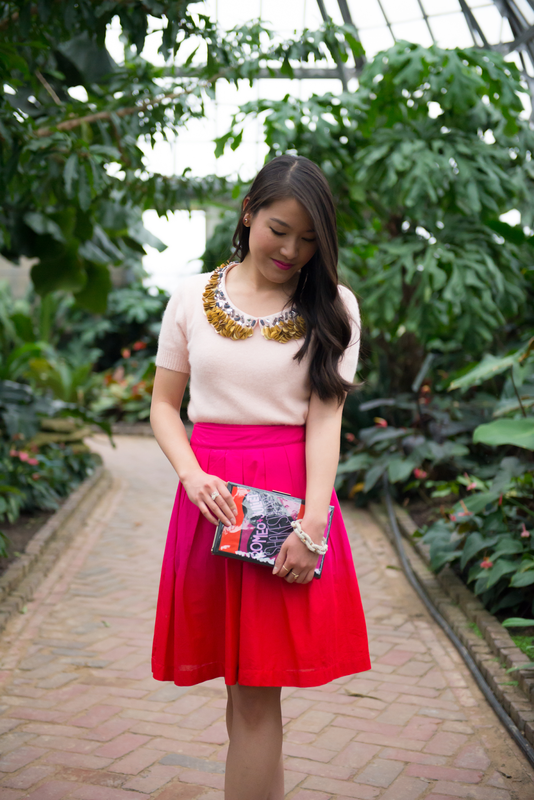 That skirt is such a pretty color and I adore that clutch! this is a gorgeous look joanna! love it! Love love love this look!! you look absolutely gorgeous! I love the idea of Galentine's day. V day doesn' t just have to be romantic love, it can be all love!! You look so feminine and chic! I love your style! Love this look, and you look gorgeous!!! I found you via Shopping My Closet's link up. This outfit is so pretty. I love pink too! It's always so interesting to find out what our friends notice about us. One of my friends asked the hostess at a restaurant to look for a cute, stylish Asian girl (me) and a guy with a neckbeard (that'd be my husband). Ha. Super cute! All of the pieces come together so nicely and you look so chic! That clutch is all sorts of awesome too! Sounds like you have a great day planned! I love that top and it's perfect with this feminine outfit. Too sweet look! Perfect for the love day! 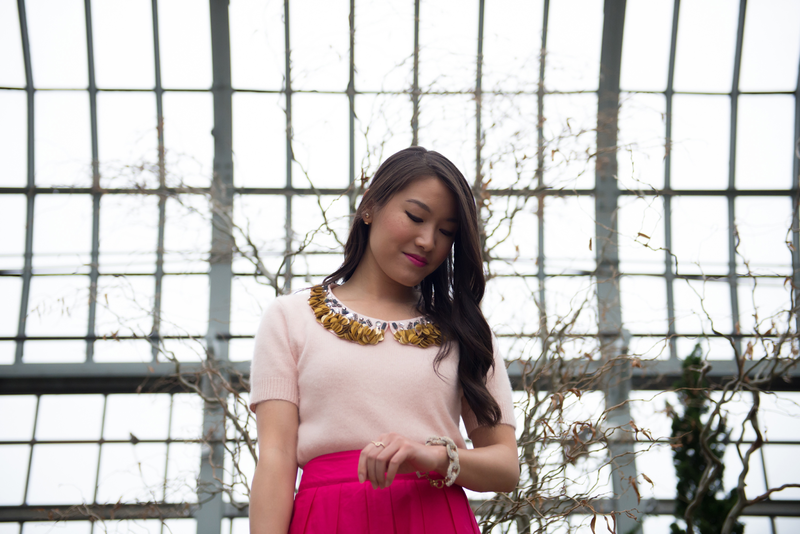 Love the pink skirt and the top's details! Very chic and Valentine's day-esque! I'm in love with this outfit! The red skirt, the embellished collar, the bow heels....just perfection. Gorgeously feminine colors and I adore the delicate details on the collar.